We were met at the airport by the hotel transfer service that Tina had arranged and were taken to the Pan Pacific Serviced Apartments. As I said earlier, we did not see any signs of the flooding other than a lot of cars parked high and dry on the side of the freeway. 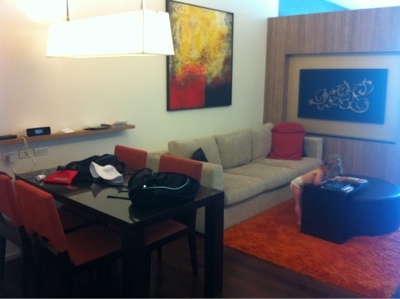 The check in process was very smooth and we are delighted with the one bedroom apartment. 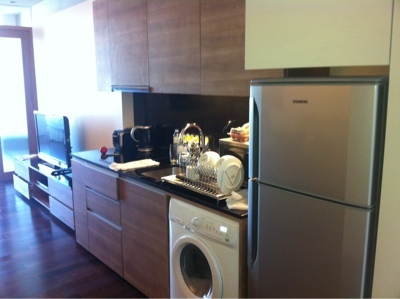 We have a kitchenette and clothes washing machine and it feels much more like a home than a hotel. There is a well stocked 24 hour supermarket right below the building too which we will no doubt find very handy. 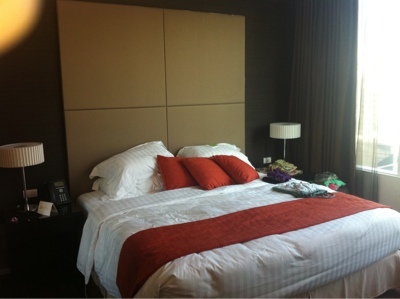 I will post some photos of our room tomorrow as it is a bit of a bomb site at the moment with laundry etc strewn about.